What’s involved in a dental exam? The first step in the dentist/patient relationship is an examination. It’s how the dentist gets to know you, learn about the goals you have for your mouth, and determines the health of your mouth. While the mouth is a small area compared to the rest of your body, it contains numerous parts that are evaluated during an exam. And while we seem to treat the mouth as though it’s not a part of your body (it’s not covered under health insurance! ), the health of your mouth is important to the overall health of your body. Let’s take a look at the examination process in my Cincinnati dental office. First, I examine the overall health of your mouth, including the tissues, gums, jaw bone, bite and teeth. If I discover any areas of concern, I like to have an open conversation about what has led up to these problems. It is important that any bad behaviors be corrected or further problems will develop. Next, I discuss what treatment you may need. When discussing treatment, I like to differentiate between things that need to be addressed immediately, and things that are more subjective. Immediate needs are things like gum disease, teeth with decay, teeth in pain. These things need to be treated ASAP or they will get worse. Subjective needs are those that aren’t obvious problems, but don’t look good to a dentist’s trained eye. Something like an old metal filling might fall into this category. Perhaps it looks OK currently, with no decay around it and no visible cracks in the tooth, but a dentist knows metal fillings will wear out over time and need to be replaced. It’s these subjective items that lead to differing opinions amongst dentists. One dentist may see an old metal filling and recommend it comes out, while another may not even mention anything about the tooth because it currently isn’t experiencing any problems. It’s kind of like a roof that is patched. If you had 2 roofers come look at the roof, one may say to replace the roof before it starts to leak and causes further damage. Another may say to wait until it’s leaking to fix it. Both have valid points. I feel like I achieve a happy medium by making sure the patient understands what is an immediate need versus what is subjective and then let the patient decide if/when they will tackle their subjective treatment needs. Once I have discussed with you the treatment you need and you have had a chance to ask questions, Keri, the Financial Coordinator, will go over the fees for treatment and get you scheduled. She will be able to help estimate insurance coverage and will work with you to fit treatment into your budget. More details about payment options can be found on our Paying for Treatment page. 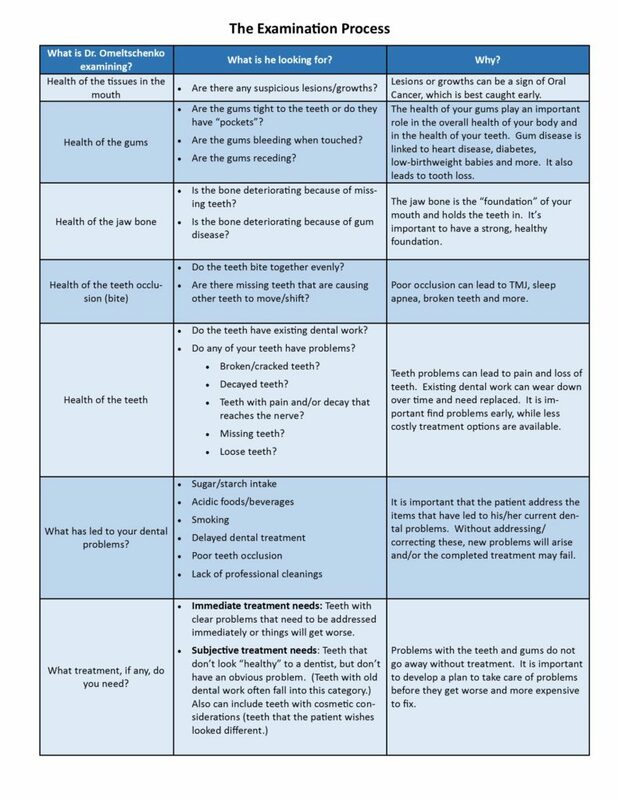 To learn more about the examination process in my Cincinnati dental office, check out the chart below. It explains each area I am examining, what I am looking for and why. If you are experiencing any dental problems, please call us today at (513) 245-2200 to set up an examination. You will be in good hands at Total Dentistry!